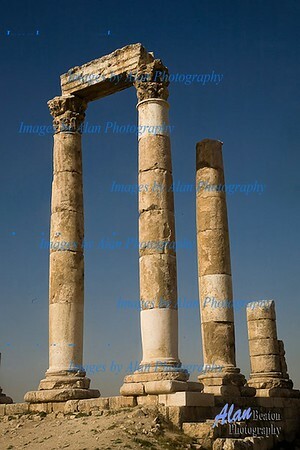 These images were captured during a visit to Jordan travelling from firstly north from Amman to the ancient city of Jerash.. We then travelled South through Madaba, Mount Nebo and Kerak to Petra, the ancient Nabatean capital . In Petra we hiked through the Siq, a deep narrow gorge formed by a split in the rose coloured sandstone rocks. At the end of the Siq stands Petra's most elaborate ruin - Al Khanzeh (popularly known as "The Treasury" ) hewn in the sandstone cliffs. Leaving Petra we went south to Wadi Rum, an extensive desert area inhabited by several Bedouin tribes. Our overnight accommodation was in a Bedouin tent.